Q: What does the word "broody" mean? When a hen is broody, that means she wants to hatch her eggs and raise chicks. 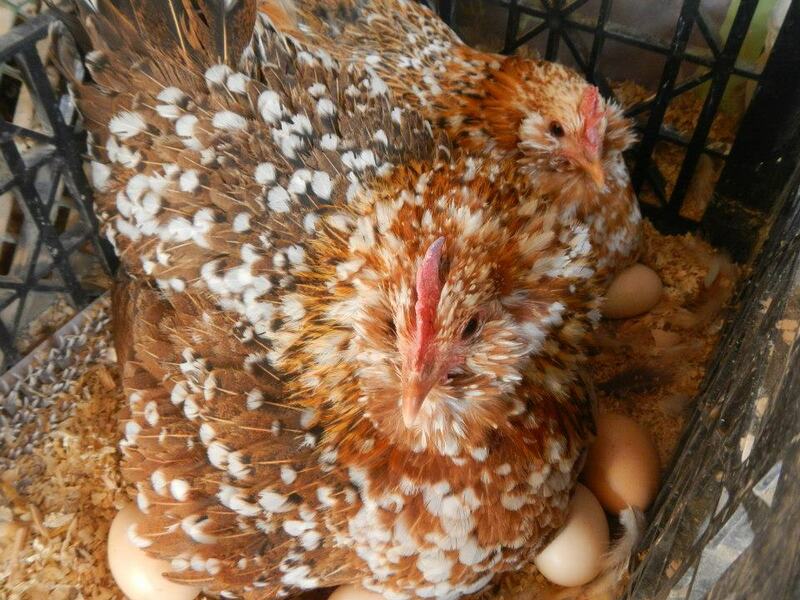 A breed known for frequent broodiness has hens that often, individually go broody. These hens may not even need eggs to set on to be broody--they may brood in a nest with no eggs. Or in a corner on rocks. Further, if there ARE eggs in the nest, if there is not a rooster in your flock, your hens will not know that their eggs won't be fertile. Your hen will seem to be in a sort of bad temper while she broods, she may pluck out her breast feathers so she can be closer to the eggs, and she may even screech a warning at any birds or people who come near her nest! Her warning means, "Stay back, this nest is mine for hatching!" Actually, we find it charming when our hens are broody--they are beautiful when they're angry!Once a day or so your hen may emerge from her nest like a whirling dervish: all her feathers will be ruffled out so she will look VERY BIG. She will hold her wings out from her body to give herself even more apparent size. She will rise with a terrible screech, and run at anyone that gets in her way. In my head, I sort of imagine that if my hens were hatching eggs in the wild, all the to-do she'd be making as she gets up would be meant to distract any thing nearby from getting her eggs while she couldn't look after them. Also, she acts so tough, I wonder if some predators would be intimidated by her fierceness? However, this movement from the nest may last 5 or 10 minutes, because all she's doing is arising to eat and drink (and poo), so she can continue to brood her eggs. 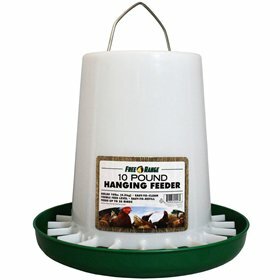 When hens are broody, they may only eat once a day, so the normal pecking order doesn't usually apply. She won't need to beat up on the other hens to prove her place. In fact, sometimes the other birds in your flock will defer to anyone in this state. I can imagine my Faverolles whispering to each other in their French accents "Eeet iz not worth your time, Juliette! Leave zis hen to her madness! 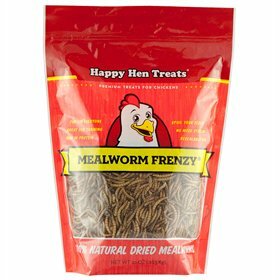 "However, you occasionally may have a girl mad at your broody hen since broody girls will usually choose the favorite nest for her production! 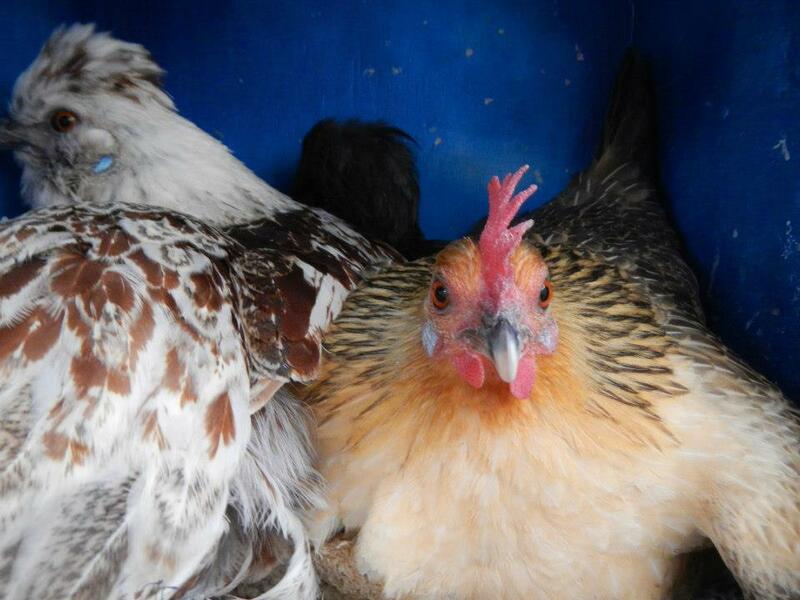 Some chicken breeds will go broody every so often and some are less likely to ever go broody. Some will stay broody a long time even with nothing in the nest, while others will snap out of it quickly if they don't have eggs to set on. Normally, they begin to snap out of it when the chicks hatch after 21 days. It can go longer if there are no chicks to snap her out of it! Silkies are among the broodiest of breeds. They make great mothers when they hatch... but if they're not hatching, they can also be among the most difficult to snap out of broodiness. 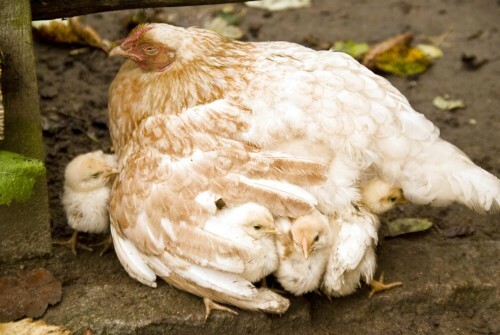 If your broody hen is actually setting on fertile eggs, it is best to separate her from the rest of the flock, since hens often like to crawl on top of the broody to lay additional eggs in the "safest" nest. If too many eggs get laid underneath her, she may not be able to cover them all, and those chicks that are developing within the outside eggs can get too cold and die. 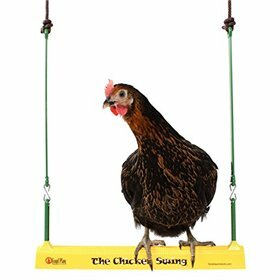 She'll also need a safe place for her chicks when they hatch. Broodiness is more annoying to human caretakers than to the rest of the flock--hens take it in stride. It can be problematic for humans simply because for one, your broody hen will stop laying while she is broody, because she is trying to hatch. 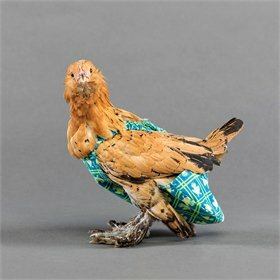 In addition, some broodies will peck at you to keep you from taking the eggs your other hens have laid underneath her (or sometimes she will switch from nest to nest "adopting" eggs for hatching, whether the eggs are fertile or not). However, if the eggs are not fertile, it's not a good idea to let them set eggs, since they eat and drink less when they are broody. 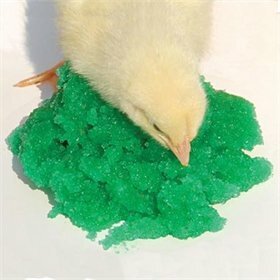 Since they don't get off the eggs to dust bathe, for example, they are more vulnerable to infestations of mites and lice. They can lose weight and condition. 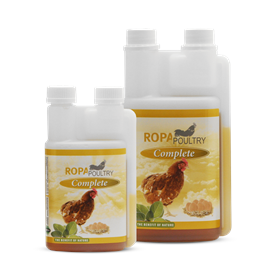 If you have a broody hen and she is not hatching fertile eggs, try to lift her off the nest at least once (or even several times) in the day so she will get enough to eat and drink. She will get over the broodiness and begin ranging with the rest of the flock again. 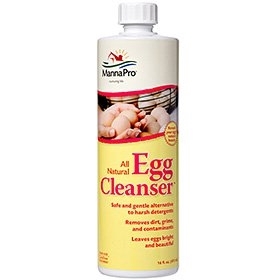 After a while, she should begin laying eggs again, and you will know that broodiness is over! 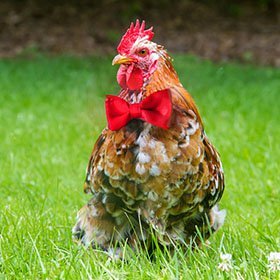 There are a number of reasons your chickens might not be laying, though, so if you suspect there's something more to it than broodiness, have a look at this list of other possible reasons your chickens aren't laying. 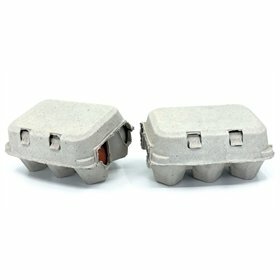 Are fertilized eggs okay to eat? 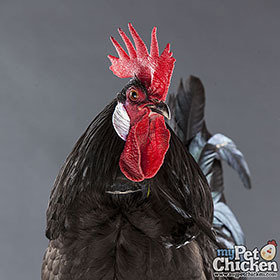 Can different chicken breeds cross-breed? 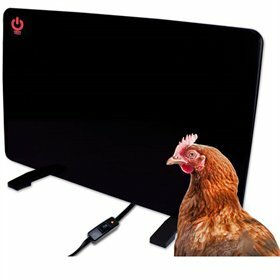 Is there a way to tell if my chicken is happy or sad? My chickens are 7 months old and I still haven't seen an egg. Why?